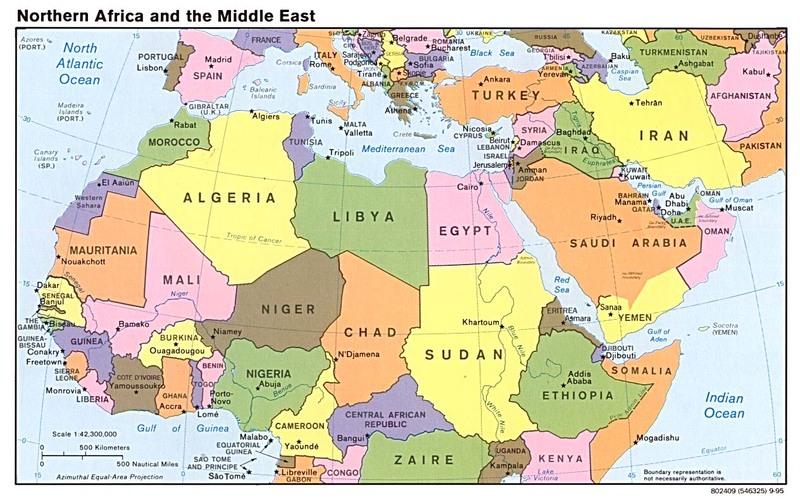 Students will learn how the countries of the Middle East were created. They will understand the influence of various political and geographic factors in their creation. Project a map of the Middle East onto a wall. Place a foam board against the wall so that map is centered on it and fills most of the board's area. Trace the outlines of the land masses, oceans, and seas. At this point, do not add political borders, names, rivers, etc. Make four outline maps of the Middle East in this way. If you were going to create a country anywhere in the world, how would you decide what territory to include? What would you want to include in your country? What would you want to exclude? What are arguments for and against having only one ethnicity or one religion in the country? How would you decide what natural resources you would need, such as water, or commodities like oil and natural gas? Is access to land or sea trading routes important? Do you need/want geographic barriers to aid in defense? Divide the class into four groups. Assign a map to each group, and have students do research to draw the appropriate features on their maps. Some suggestions for research sources can be found in the Resources section. Group I will draw the outlines of the Ottoman Empire and surrounding polities before World War I on an acetate sheet using overhead markers. Students should take turns marking political boundaries of states and administrative districts (where appropriate), political influence of outside powers, and capital and other major cities. Next to the name of each country, the students should write in parentheses the name of that country's leader in 1910. Group II will draw the new states of the Middle East created after World War I. Students should take turns marking political boundaries of states and administrative districts (where appropriate), political influence and control by outside powers, and capital and other major cities. Next to the name of each country, the students should write in parentheses the name of that country's leader in 1925. Group III will indicate the ethnicity, language, and religious composition of the Middle East, identifying concentrations of groups using a color or pattern code (with a key), pie chart, or other indicator. Groups should include, for example, Muslim Turks, Muslim Arabs, Christian Arabs, Kurds, Armenians, Persians, Greeks, Jews, Berbers, Druze, etc. You may have the students indicate all combinations of ethnicity, language, and religion, or choose one or two categories on which to focus. Group IV will indicate the physical geography and natural resources of the Middle East. The group should identify the major rivers and other bodies of water, major mountain ranges, forests, arable land, deposits of oil, gas, and minerals, etc. 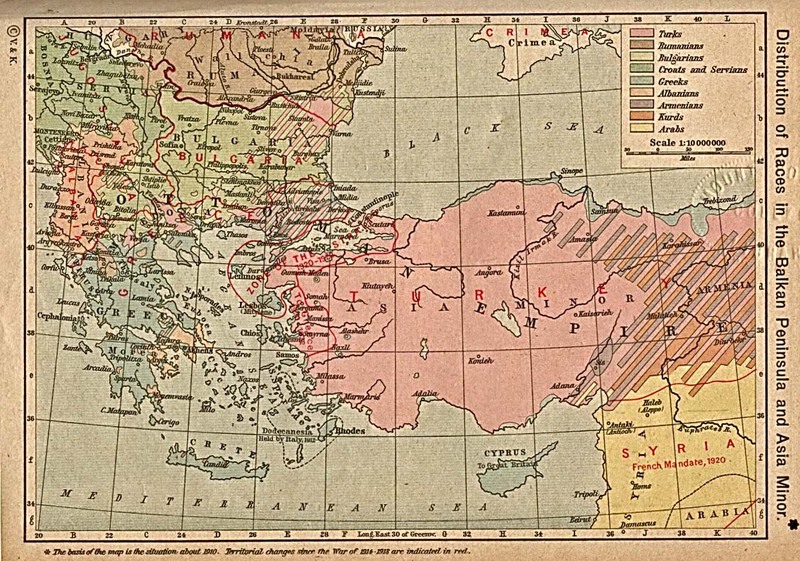 Ask each group to present the map it developed, beginning with the Ottoman (as the earliest). This will provide all students with an overview of the region. How were the borders and foreign zones of influence or control determined? What European power got control over which country? Next, place the Ethnic Groups and Religions layer over the previous two. Discuss how this information fits with the post-WWI boundaries. Are there any apparent alignments between particular ethnic and religious groups and certain European powers? What ethnic groups with concentrations of population in the Middle East did not end up with a nation-state? Why do you think this happened? Replace the Ethnic and Religious layer with the Natural Resources layer. How does the distribution of natural resources coincide with post-WWI boundaries? What countries are rich in water, oil, and other natural resources? Which are poor? 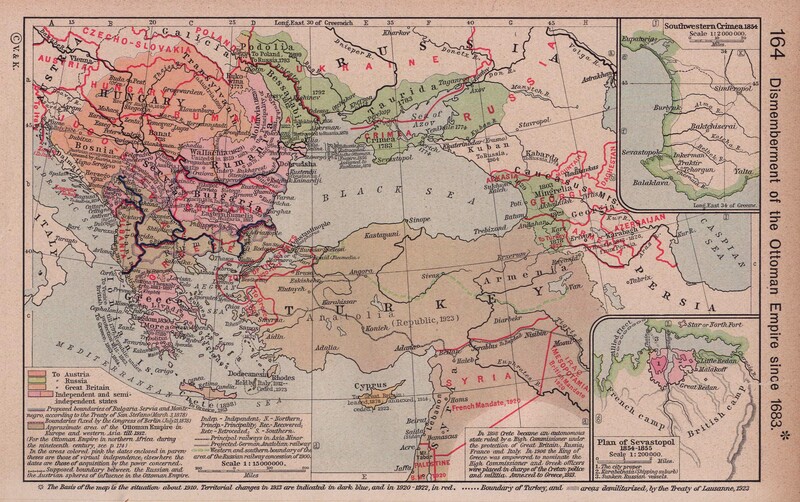 Remove the layer with the post-WWI boundaries, leaving only the outline of the Middle East. Ask the class to imagine that they are a committee convened in 1920 to redraw the political map of the Middle East to create politically stable and economically self-sufficient nations. Clip a blank acetate sheet over the foam board map. Ask the students to list the things they should consider in deciding how to draw new borders in the Middle East. What is the relative importance of factors such as ethnicity, language, religion, political strength of various people and states (both insiders and outsiders), population, natural resources, and natural features of geography? Use student input to sketch out possible borders taking into account these factors, and demonstrating how borders might change if one were giving more weight to one factor or another. To what extent did students incorporate appropriate and accurate information (in graphic or textual form) and accurate reasons for their decisions? How many factors contributing to the establishment of nations has the student included to indicate how well he or she understands how the countries of the modern Middle East were created? To what extent can the student express orally or in a written summary paragraph the influence of various political and geographic factors in the creation of the modern Middle East? How were the modern nation-states of the Middle East created? What role have natural resources played in the politics and economy of the Middle East? National economies throughout the Middle East struggled in the 19th and 20th centuries to develop their natural and human resources, to modernize their societies, and to raise their standards of living. The Middle East is at the junction of trade routes connecting Europe and China, India and Africa, and all the cultures of the Mediterranean basin. 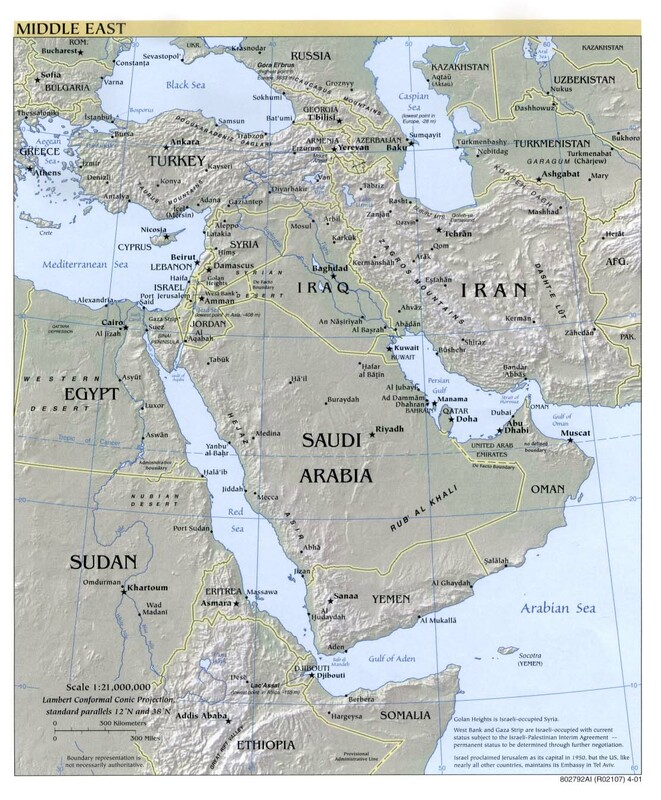 These maps are from the Atlas of the Middle East, published in 1993 by the U.S. Central Intelligence Agency. Continue the mapping exercise with an exploration of the Israeli-Palestinian dispute. Explore the region in 1945, 1948, 1967, 1973, and today. Discuss with students why Israel was created. How have its borders changed over the years? Why? How might the borders be redrawn today to create a Palestinian state? The same procedure of creating layers of acetate maps may be used for many different activities to help students understand the way geographic and political factors interact in a region. Students might, for example, use the maps to track trade routes or natural resources and the manufacture of particular products over time. Students could also create a series of historical maps and use them to see how conquest changed borders and with what effect. Further explore why some ethnic groups with concentrations of population in the Middle East did not end up with a nation-state. Have students research arguments made by and promises made to the Kurds and Armenians in regard to their obtaining an independent state of their own. Create, interpret, use, and synthesize information from various representations of the Earth, such as maps, globes, and photographs. Examine, interpret, and analyze physical and cultural patterns and their interactions, such as land use, settlement patterns, cultural transmission of customs and ideas, and ecosystem changes. Describe, differentiate, and explain the relationships among various regional and global patterns of geographic phenomena such as landforms, soils, climate, vegetation, natural resources, and populations. Describe and assess ways that historical events have been influenced by, and have influenced, physical and human geographic factors in local, regional, national, and global settings. For more information, see the National Standards for Social Studies Teachers, Volume I.